Villa Dawn, a luxurious St. Croix villa, is located on the lush north shore of St. Croix in the US Virgin Islands, the most beautiful part of the island. This private, secluded and tropically landscaped, 1.3 acre, St. Croix estate includes a four bedroom, three bath vacation rental with breathtaking views of the Caribbean Sea and its stunning sunsets. It is only steps away from the white sands of Cane Bay Beach and four waterfront restaurant/Bar and Grills. In fact, it is the closest villa to gorgeous Cane Bay Beach. The views from inside this extraordinary, St. Croix, vacation home, from the front covered veranda and from the pool deck are spectacular! The large pool has four stools in the water where you can sit and enjoy the view and the fountain that flows into the pool. Villa Dawn has central air conditioning and is outfitted with tropical designer furnishings and every conceivable amenity. There is world-class SCUBA diving at the Cane Bay 'Wall' right in front of Villa Dawn, many nearby attractions and a championship golf course is just a ten minute drive from this dazzling vacation home. Our caretaker of the property lives nearby and is available 24/7 for any and all of your needs. If you are looking for a special vacation rental with that extra touch of luxury in a stunning location that can't be beat, then Villa Dawn is definitely your choice! Villa Dawn vacation rental is literally just steps from the beach. While some villas advertise 'walking distance to the beach,' they are truly a 'hike to the beach.' Not at Villa Dawn! This exclusive property goes all the way down to the coast road. On the other side of the road is the fabulous Cane Bay Beach! Villa Dawn has unobstructed views of Cane Bay Beach, the Caribbean Sea, and the surrounding lush mountains from the large front covered veranda as well as from most of the 1.3 acres that make up this St. Croix, USVI island paradise. Recline in the hammock on the large front veranda of this comfortable vacation home and listen to the soothing sounds of the Caribbean waves while gentle island breezes caress you. Go swimming in the pool... it's spectacular. Enjoy the lighted fountain with a waterfall that overflows into the pool. Bask under the St. Croix sun around the pool on the 1500 square foot deck or sit on one of the four in-water stools while you watch the stunning sunsets over the Caribbean Sea... watching for the elusive 'green flash.' Yes... you are in paradise! Three of the four bedrooms and two of the three bathrooms are located on the upper level of this centrally air conditioned, fully equipped, designer decorated villa. The upper level's large gourmet kitchen and comfortable living room both have magnificent views of the Caribbean Sea from the villa's 'wall of windows.' The air-conditioned and private lower level of Villa Dawn is fully-equipped with one bedroom, a living room, a kitchen, and a bath. The lower level also has a 'wall of windows' that offer spectacular views from all of the rooms. Both levels are equipped with TV, VCR, and complete AM/FM/CD/Cassette stereo systems. No amenities have been forgotten at this beautiful retreat. Duty free shopping and additional fine dining is just a 20 minute drive to either Frederiksted or Christiansted. For your privacy, we will only reserve Villa Dawn to one group at a time. We are available 24/7 for any and all of your needs. We accept Checks, Visa, Mastercard and Discover as payment. My wife and I love to travel! We work very hard...just so we can spend all of our money on traveling! We have been all over the world, but what is nearest and dearest to our hearts are tropical destinations. Of all the places we have traveled together, St. Croix was the place that we truly fell in love with. We love to swim, snorkel, SCUBA dive (St. Croix has some of the best diving anywhere), sail, eat, drink, shop, eat and drink some more...St. Croix has it all! We visited St. Croix for the first time in 1998. We had already been to many of the Caribbean Islands, as well as many other tropical destinations, so we thought we would give St. Croix a try. We invited my parents to come with us and rented a villa not too far from where Villa Dawn is located. One day during this fateful trip, after my Dad and I probably had one too many Rum drinks, I sat looking out at the view and dreamed of one day owning a home of my own on St. Croix. I told my wife that I had been calculating....if we used all of our savings we just might be able to buy a house on St. Croix and rent it enough to pay the bills. She said, 'That's a nice idea but I don't think so!' The next morning, as I was sitting out on the deck nursing a terrible headache, she came over and said, 'You know, I've been thinking, you're probably right, we could do it' to which I replied 'Do what?' I didn't remember the conversation at all! Several months later we were on a Caribbean Cruise with Dawn's Mom and St. Croix was one of the Ports of Call. We decided to look at some real estate...just for the fun of it. By noon that day we found Villa Dawn, a mere shadow of what it is today, and put in an offer. The next day we were docked on St. Thomas. We called the real estate agent on St. Croix from a phone on the beach. 'Did they accept our offer?' we asked. YES! was the reply! OH...MY...GOSH! WHAT DID WE DO! The rest is history...we now own three vacation rental properites on St. Croix! 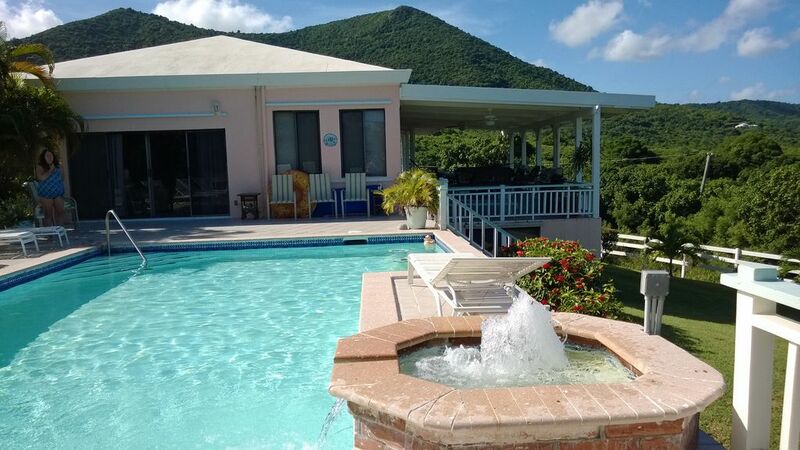 Villa Dawn is located in one of the most beautiful areas of St. Croix. The views are as good as any I have seen in the world! It is within a short walk of Cane Bay Beach, 4 waterfront restaurants, horseback riding, kayak rentals, SCUBA diving and snorkeling. It is an awesome place for a couple wanting some privacy and romance, as well as a great place for multiple couples or a family vacation. Everyone just loves the place! outdoor shower, Rinse off after the beach and for rinsing SCUBA gear. There are no other villas or condos between Villa Dawn and Cane Bay Beach. Villa Dawn is set back on our 1.3 acres with an amazing, panoramic view of the Caribbean Sea. Beautiful Cane Bay beach is just a 3 minute walk down our driveway. Villa Dawn is nestled at the foot of lush, green mountains with 180 degrees of spectacular Caribbean Sea in front of us. Villa Dawn has sweeping, panoramic views of the Caribbean Sea and spectacular sunsets. There are no other villas or condos between Villa Dawn and Cane Bay Beach. Central A/C on main level, separate unit for lower level suite. Side by side with ice maker. Large gourmet kitchen on main level with every amenity. Additional small kitchen in lower level suite. Inside dining for 6 at table, 4 at island, 2 at small table. Additional seating on veranda. Good selection of VHS tapes. DVD player also available if you bring your own movies. Large grass yard with lots of tropical plants and palm trees. Property is 1.3 acres and extends all the way down to the small coast road. Rentals located right across the street from Cane Bay Beach. 1500 square feet of tiled outdoor living space. Half covered, half around the pool. Second hammock, comfortable seating and large dining table located on the covered deck. Some gear provided. SCUBA and snorkel gear available for rent at Cane Bay Dive shop. Carambola Golf course just 10 minutes away. Large pool with four in-water stools and a fountain flowing into the pool. Pool has awesome ocean and sunset views. 11 lounge chairs, 8 chairs and a hammock are located on the pool deck. Wireless Broadband Internet Access at no additional charge, Central Air Conditioning, Videos, Books, Games, Weber Stainless Steel Gas Grill (BBQ), Beach chairs, beach umbrellas, coolers, beach towels, high-chair, pack-n-plays, No amenities have been overlooked! No Smoking of any kind allowed inside of villa. Great house, beautiful view w/awesome pool, fabulous home owners! Highly recommend this house and the owners! Beautiful house over looking the sea.! We absolutely loved this location. Close access to cane bay and beautiful beaches. Private, clean, wonderful views, etc. Highly, highly recommend! So happy you enjoyed you stay at Villa Dawn! We hope you will be able to visit St. Croix again some time. We'd love to have you back at the villa! Well-maintained property overlooking Cane Bay...a very short walk down the hill and you're at the beach. Villa is extremely well-stocked and clean. We really enjoyed the big covered porch area, too. You're likely to spot the occasional deer and mongoose near the property. You really don't need to do anything here other than show up -- they have everything, including beach chairs and towels, etc. Note that, despite the beach bars and restaurants along the bay, this is a generally quiet area (which we appreciated). It takes about 20 minutes to get to Christiansted from here. We are so glad you enjoyed your stay at Villa Dawn! We try very hard to make your stay as comfortable as possible and include everything you would have in your own home. Villa Dawn is a special place and we hope that you will return sometime! Thanks for staying at Villa Dawn! As far as I’m concerned Cane Bay is the best location on the Island. Villa Dawn and the Cane Bay Area had evening and more. The location is centralized between the towns of Frederiksted and Christiansted. The outdoor space at Villa Dawn is incredible. The pool, veranda, and views are amazing. The property has plenty of privacy. The neighbors seem to be mostly owners. The Caribbean Sea and Cane Bay Beach is a short distance away. You can hear the waves from the pool and veranda. To be in the Caribbean and on the beach is a real treat. It’s fun to watch the divers, teams of swimmers and the people snorkeling. Their are 3 nice beach bar restaurants close with great food and music. We enjoy the small shops in the two towns and finding good restaurants around the Island. A must do is to take a ride to Udal Point which is the most eastern point of the US. The stone sun dowel monument is cool but the views are the best on the Island. I was there less than a week ago and I already miss it. I watch the live webcam from Eat@CaneBay daily. Villa Dawn is also very nice inside. Very spacious, nice bedrooms and baths. The owners are very nice. We celebrated my 60th birthday and Valentines Day on the Island. It was the best. I am hooked on St.Croix, Cane Bay, and Villa Dawn. Can’t wait to go back. Thanks Kent & Dawn for sharing such a special place. Jim D.
We are so happy that you enjoyed Villa Dawn, Cane Bay and St. Croix! I have to agree that the 'North Shore', as the area from Columbus Cove Marina to Cane Bay is referred to, is the best part of the island. Villa Dawn is a very special place and we are very blessed to own it, and to be able to have shared it with hundreds of guests over the past 20 years! We hope that you do get to come back to Villa Dawn again! Thanks for being such great guests! Villa Dawn has everything! With chairs/towels, coolers, plenty of kitchen which allows you to really relax and take advantage of one of the best locations ever. Pool, proximity to beach, food and world class scuba is all amazing. It is so easy to stay here it’s for sure fantastic. One step out on the patio and the relaxation starts. CANCELLATIONS - no refunds will be made within 60 days of stay. Refunds will be made up to 60 days prior to your stay if we can re-rent your reserved dates. See our rental agreement for complete cancellation details.